My advice for a romantic valentine’s day is: Don’t go out for dinner! An easy well-planned romantic dinner at home, such as grilled duck breast with a cherry sauce paired with a thoughtful gift and/or flowers, is a perfect way to celebrate. Here’s my reasoning. First, its difficult to get a reservation. Secondly, you have to fight traffic, crowds, and to top it off usually there is a wait at the restaurant. Last but not least, with the drinking and driving laws you will probably want to get an Uber back home which is just another cost on an already expensive and crowded night. 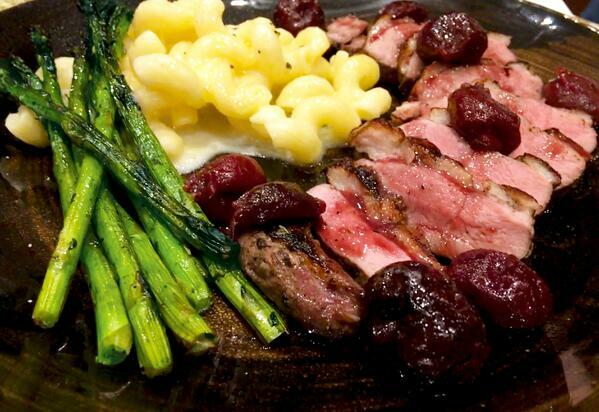 Staying home to make dinner is made even more memorable with my delicious and easy to make Grilled Duck with Cherry Reduction Sauce recipe. The total meal with the duck, sides and a nice bottle of wine comes out to about $95.00. It is a win for the bank account, win for the taste buds and a win for a calm night with the person that you love. You can enjoy a lovely meal and take pride in your grilling skills. My recipe below includes side dishes to help you complete your Valentine’s celebration dinner. May I suggest chocolate covered strawberries for dessert? Using a sharp knife, score the skin of each duck breast in a diamond pattern. Salt and pepper both sides of the duck and place in a reusable plastic bag. Add 1 cup of the cherry juice and seal bag, allow the duck to become room temperature, and sit for about 45 minutes. NOTE: Because this is Valentine’s Dinner, I suggest while the duck is marinating, set the table and begin preparing the sides below and your cherry sauce. Place duck breasts skin side down on grill grates. PRO TIP: Duck skin tends to be very fatty, be careful not to leave the grill unattended. 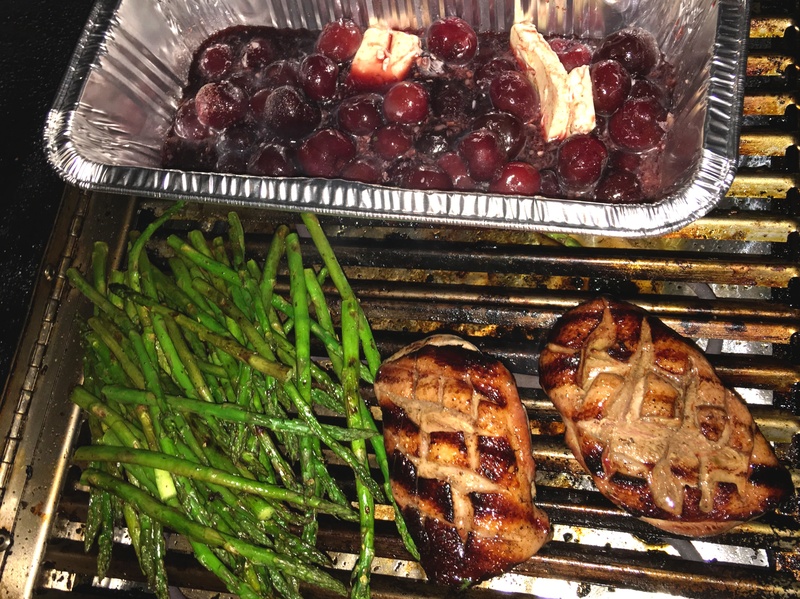 Have the cherry sauce and your vegetable side at grill before placing duck on the grill. In case of flare-ups, have an aluminum pan on the side of the grill to remove the breasts until the flames subside. The flare-up sometimes occurs after 10 minutes of the duck being on the grill because the duck skin begins to melt through the grill grates, be careful! Once skin side of the duck is seared, turn duck for another 8-10 minutes or until the internal temperature is 130-135°F or medium rare. Let rest for 5 minutes and slice on a bias. NOTE: If you remove the duck from the grill at 125°F you can place the duck in the saucepan with the cherry sauce. The duck will cook a little longer and after about 4 minutes remove the breast and the internal temperature will increase to 135-140°F leaving a slightly pink center. Let breast stand for 5 minutes then slice each breast on a bias and serve with the cherry reduction sauce and side dishes. I would not let the duck cook much longer, it will become very tough. Add and combine the red wine, cherries, 1/2 cup cherry juice, cumin and thyme to a grill safe pan (I suggest a disposable aluminum pan). Allow to simmer on the grill and reduce by at least half, about 12 minutes. Add the butter to ferry sauce in a pan, remove the pan from grill until duck breasts are almost grilled to temperature. Place pan back on grill and simmer until sauce is thick and coats the back of a spoon, about 10 more minutes. Duck breasts can be removed from the grill and added to the sauce at this time. (See instructions above) Adding the duck breasts to the sauce will add another dimension to the flavor of the sauce and help finish cooking the duck. Season sauce to taste with salt and pepper. Gently stir. Place beans or asparagus slightly wet from rinsing on the grill when you turn the duck. Be sure to remove vegetable if a flare-up occurs to prevent charring. Leave on grill for about 10 minutes or until desired doneness. NOTE: Pasta can be made ahead the day before. Remember to let chilled pasta return to room temperature, this will reduce reheating time. Bring about 4 quarts of salted water to a boil over high heat in a large pot. Add the pasta and cook according to package directions or until al dente, about 8 minutes. Drain and set aside. Reserve 1/2 cup pasta water. Place milk and heavy cream and butter in a medium saucepan over low heat. Keep the heat low and begin mixing small handfuls of shredded cheese into the milk mixture. Stir until all the cheese has melted and the sauce is creamy. Adjust the seasonings as needed (salt & pepper). Place the pasta and 1/2 of the cheese sauce in a large serving bowl. Stir to coat the pasta evenly then add the remaining sauce and truffle oil. Mix well and serve immediately, pasta is best when served warm. Enjoy your grilled duck breast with cherry sauce and have a Happy ❤️ Valentine’s Day! What’s Next? Check out these great natural flavor enhancing grilling tips before you head out to the grill!